Introduction: Full completion of the pre-operative checklist is important for proper preparation of patients before they enter the operating room (OR), thus increasing OR efficiency. It is also critical for patient safety and successful outcomes. According to various literature, full completion of pre-operative checklists varies widely between institutions and occurs anywhere between 21% and 92% of cases., Our pre-project audits revealed a suboptimal patient preparedness for the Winchester District Memorial Hospital (WDMH) OR, since only 25% of cases arriving at the OR had their pre-operative checklist completed in its entirety, with no omissions. Methods: WDMH performed a 12-month long quality improvement (QI) study to improve patient preparedness for the OR. Multiple QI initiatives were used to induce behavioural change by incorporating process mapping, enabling communication, adjusting the pre-operative checklist based on qualitative staff feedback and implementing a staff education plan. Interventions also included two post-implementation audits. Results: Remarkably, completion of the pre-operative checklist increased from 25% to 67% and finally to 94%. Furthermore, the previous chart's presence and completion of pre-operative orders improved from 87% to 100% and from 82% to 99%, respectively. Another significantly important secondary outcome was improvement in interdepartmental relationships and collaboration. With better communication and checklist completion rates, there came increased patient preparedness and improved efficiency. Conclusions: Multiple significant improvements and many additional minor improvements strongly suggest that the approaches were used were effective at improving patient preparedness. Introduction au résumé: Il importe de remplir complètement la liste de vérification préopératoire afin de bien préparer les patients avant leur entrée dans la salle d'opération, ce qui favorise l'efficacité dans la salle d'opération. Cela est aussi essentiel à la sécurité des patients et à l'obtention de résultats positifs chez eux. Selon diverses publications, la réalisation complète de la liste de vérification préopératoire varie considérablement d'un établissement à l'autre, soit de 21 à 92 % des cas,. Nos vérifications d'avant-projet ont révélé que les patients du bloc opératoire du Winchester District Memorial Hospital (WDMH) étaient préparés de façon sous-optimale, puisque à peine 25 % des listes de vérification préopératoire étaient complètes et sans omissions à l'arrivée des patients à la salle d'opération. Méthodes: L'hôpital WDMH a réalisé une étude d'amélioration de la qualité (AQ) de 12 mois dans le but d'améliorer la préparation des patients pour la salle d'opération. De nombreuses initiatives d'AQ ont été mises de l'avant pour changer les comportements, soit incorporer la schématisation du processus, favoriser la communication, ajuster la liste de vérification préopératoire en fonction des commentaires qualitatifs du personnel et mettre à exécution un plan d'éducation du personnel. Les interventions comptaient aussi deux vérifications après exécution. Résultats: Remarquablement, la réalisation complète de la liste de vérification préopératoire est passée de 25 à 67% et finalement à 94%. En outre, la présence du dossier et l'exécution des ordonnances préopératoires se sont améliorées, pour passer de 87 à 100 % et de 82 à 99 %, respectivement. L'amélioration des relations et de la collaboration entre services était un autre paramètre d'évaluation secondaire significativement important. La meilleure préparation des patients et une meilleure efficacité ont suivi l'amélioration des communications et des taux de réalisation de la liste de vérification. Conclusions: Les nombreuses améliorations significatives et mineures pointent fortement vers l'efficacité de l'approche utilisée pour améliorer la préparation des patients. Patient preparedness for the operating room (OR) is both complex and multifaceted. Properly preparing patients for the OR in a timely, effective and thorough manner, while adhering to full completion of pre-operative checklists, is a key to ensuring patient safety and comfort, leading to increased efficiency of the department and ensuring success of the procedure. Increased preparedness can be associated with post-operative improvement, increased staff and patient satisfaction and improved quality of life. Despite the proven benefits of checklist completion, literature has shown that adherence to and completion of checklist guidelines are often inconsistent and lacking. A review performed by Gillespie and Marshall in 2015 revealed that within the few studies which measured compliance, reported rates of total completion, post-implementation, ranged from 39% to 92% and went further to argue that within the majority of the reviews, checklists were incompletely or inconsistently executed. These results are consistent with a 2017 study performed by Erestam et al., which showed that upon the introduction of the WHO surgical checklist in a hospital in Sweden, only 21% were fully completed, with no omissions. The commonly cited causes were poor staff understanding of the importance of every component, breakdown in team communication and lack of employee buy-in. The Gillespie and Marshall 2015 review also identified the lack of literature successfully addressing the ongoing issue of suboptimal checklist completion and consistency. Furthermore, the review looked at when, why and how implementation of surgical checklists worked and when they did not. It concluded that the checklist strategy was developed and advocated for, to eliminate preventable adverse events in high-risk clinical situations, by creating more dialogue among team members, improving team communications and reducing interruptions and distractions, while increasing identification of errors before surgery. Late in 2015, Winchester District Memorial Hospital's (WDMH's) OR Department participated in the National Surgical Quality Improvement Program-Ontario® (NSQIP-ON), a provincially driven surgical quality improvement (QI) programme initiated through Health Quality Ontario. WDMH was one of only two participating rural hospitals and had limited formal experience in, or infrastructure for, QI. After programme completion and as part of NSQIP-ON participation, the OR team was asked to identify and improve the quality of one challenging OR care area. The team conducted an audit on the pre-operative checklist which revealed that although the completion of the pre-operative checklist is more than 90%, completing it in its entirety, occurred in only 25% of the cases. The team determined that this deficiency is a safety concern and, as such, presented a potential opportunity for a QI project. Our primary aim was to increase the pre-operative checklist completion in its entirety to 80% by April 2017 and to provide a detailed description of our results throughout this 12-month QI study. To our knowledge, this study is the first to look at ways of improving pre-operative patient preparedness and the pre-operative checklist in such detail and in a rural setting. WDMH is a teaching community hospital located 50 km south of Ottawa in a rural area with few small villages. It serves a largely rural, geographical area of 1500 km with a population of approximately 37,000. Its services include emergency, childbirth centre and diagnostic imaging, including digital mammography and computerised tomography scans. It offers inpatient medical and surgical services, as well as day surgery services, complex continuing care and outpatient clinics. WDMH is also a hub site for cancer care, dialysis and cataract surgery and offers specialty clinics with visiting specialists from Ottawa hospitals. The WDMH operating department has three operating theatres with pre-operative (surgical day care) and post-operative (post-anaesthesia care unit) beds. The unit runs 5 days a week from 0800 to 1500, with on-call staff for emergency cases after hours, including statutory holidays and weekends. However, staffing varies each day based on the surgeries to be performed. In 2016–2017, there were 4235 surgical day care cases and 532 inpatient surgical cases at WDMH. The unit provides surgical services for endoscopy/colonoscopy screening, therapeutic, gynaecology, general surgery, obstetrical (C-sections), ENT (including but not limited to, tonsillectomy, thyroidectomy and sinus surgery), ophthalmology (eyes), plastic surgery (e.g., breast reconstruction following mastectomy) and urology. This QI study received an administrative review, and ethics exemption was granted by the WDMH Ethics Committee. One of the initial processes completed by the research and OR teams was to map the entire patient flow from the time the staff at various departments were aware that the patient was going to the OR until the time the patient was OR ready. The methodology used was based on the lean value stream mapping processes, a method for mapping a series of events of a service from its beginning through to the customer. The group was required to break down the process for each department to identify the unique gaps. The second intervention performed by the group was a qualitative evaluation to get feedback from 60 members of the front-line staff on how 'patient preparedness' was defined to them in their professional opinion. The questionnaire targeted OR, medicine/surgery and emergency room nurses and was administered by the OR nurse team lead (TL). The questionnaire was administered in a non-formal face-to-face interview that sought to gather input from staff. The questionnaire also served as a form of staff education, since the process of interviewing staff and paraphrasing questions made individuals more aware of their contribution to the patient preparedness dilemma. Once the unique challenges of each department were identified, results of process mapping were communicated to the TLs of each department. Each TL oversaw sharing the findings and the identified communication gaps with their respective team. Subsequently, multiple interdepartmental team meetings and brainstorming sessions took place. This enhanced the collaboration between departments, as the teams began to think and work as a cohesive group in their search for solutions. The teams tailored a streamlined process between departments that focused on communication between TLs and the OR float nurse, an extra-scheduled nurse who floats between recovery room and OR to allow other nurses to take their breaks and help when needed. As soon as the OR float nurse was notified of a case coming to the OR from another unit, the OR float nurse would call the sending unit TL with an approximate surgery time and surgery reason, which was sometimes not previously known by staff in the sending unit. The sending unit TL would then indicate whether the patient would be ready for the designated time and be given the opportunity to present other concerns such as unclear surgeon pre-operative orders or specific circumstances unique to the case. Any delay or change to case order was also communicated back and forth to prevent any knowledge gaps. The feedback gathered from the previous steps was used to make the pre-operative checklist more efficient and precise. It is important to highlight that the checklist went through multiple phases of change which included many elements such as, but not limited to, the addition of malignant hyperthermia, isolation precautions, the inclusion of more extensive information related to vital signs, Nil per os (NPO) and bowel preparation. Initially, the physician lead of NSQIP, who was also the chief of surgery, along with the OR nurse TL offered the interested front-line staff to attend a 2-day provincial QI training. The resulting team was comprised of one surgeon, one administrative lead, one infection control personnel and four nurses. After the training, this team helped create the QI project and educate other members of the hospital on the issue. Education was delivered by the hospital educator, charge nurses and unit TLs, to nursing staff who worked in departments that send patients to the OR (e.g., emergency, medicine/surgery, complex care and labour and delivery). 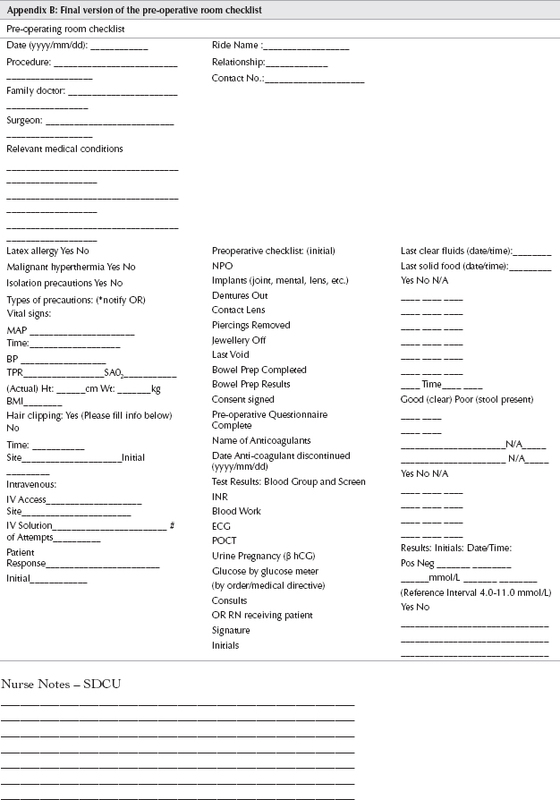 It is prudent to note that although information pertaining to the revised OR checklist was important for staff who regularly send patients to the OR, it was equally important for units that less frequently use this form as they are often unaccustomed to the process of patient preparation for the OR. Education was delivered through both individual and small group sessions throughout the hospital on both days and evenings to reach the largest number of staff working during the various shifts. Face-to-face teaching is often preferred by staff as it provides the opportunity for clarification or further explanation of the subject, in addition to identifying any issues with the nurses' understanding of its proper use. Data were retrospectively collected for eight indicators and from patient charts. Patient charts were reviewed using the designed audit checklist. To determine the impact of the interventions, three audits (pre-post-post) were conducted using a checklist [Appendix A] in time periods before and after the interventions. Evaluative techniques were performed by the authors themselves. 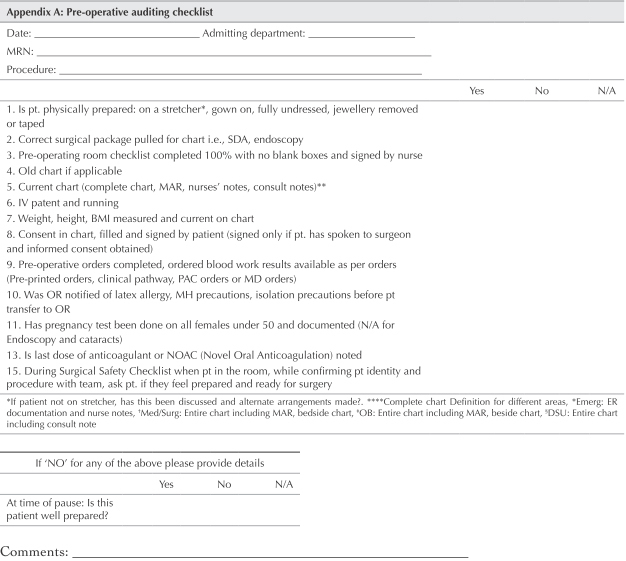 During Phase I, baseline data were collected by a pre-operative auditing checklist, which included factors such as physical preparation, completion of the checklist, allergies and anticoagulant therapy documentation. After implementation of the interventions, a second and third audit (Phase II and Phase III) took place at 6-month intervals following the baseline, which extracted the same data from patient charts. The second and third audits enabled the assessment of the impact of the pre-operative preparedness teaching moments (signs and one-on-one) since a more streamlined and accurate patient preparedness process would indicate an improvement in staff understanding and implementation. Quantitative investigations were used to report the data sets using common statistics such as percentages and graphs to describe the raw data, identify patterns and visualise the data. The significance of differences between audits, second audit versus baseline and third audit versus second audit was tested using Chi-square tests or Fisher's exact tests, as appropriate. To protect the participants, the data pulled for this study were irrevocably de-identified to alleviate any privacy risk. The researchers performing the study did not report any ethical concerns regarding their roles in the study. To measure the effect of the QI plan, data were retrospectively collected for 8 indicators and from 554 patient charts. At baseline, 289 eligible patient charts were reviewed using the designed audit checklist, resulting in the information in [Table 1]. [Table 2] identifies the gaps in the checklist process. Feedback from 60 members of the front-line staff on how 'patient preparedness' was defined is documented in [Table 3] and [Table 4]. The checklist, which went through multiple phases of change, is shown in [Appendix B]. Over the course of the project, there were two post-audits (Phases II and III) that took place to re-measure the indicators on the audit checklist. The two post-audits were conducted at 6-month intervals following the baseline. In Phase II, 142 patient charts were examined. The Phase II audit showed a significant jump in the pre-operative checklist completion from 25% to 67%. All other indicators either stayed at the same high percentage or increased. In the Phase III audit, 123 patient charts were examined, showing another upsurge in the 'pre-operative checklist completion' from 67% to 94%. Indicators either maintained a high percentage or improved, except the 'anticoagulant therapy was documented' indicator which decreased 1% from Phase II and 4% from baseline data. Full results are presented in [Table 1]. The original deficiency of the checklist was not only due to a poorly designed form but also a result of dissonant relationships between the various departments. Qualitative evaluation at the beginning of the study uncovered the fact that the departments were often unaware of each other's duties and responsibilities. We also learned that staff are eager to be involved in QI studies. As an example, the education sessions were well received by the nurses, and they appreciated being consulted to provide input to the QI initiative. The results from our 12-month QI study on improving pre-operative patient preparedness exceeded our expectations. Using many behavioural-changing approaches resulted in OR patients becoming consistently and increasingly better prepared for their surgeries. The audit results for 7 out of 8 indicators improved, with the most important being the pre-operative checklist with 100% completion increasing from 25% to 94%. Unexpectedly, the original deficiency was not only due to a poorly designed form but also a result of dissonant relationships between the various departments. Consequently, the QI study not only improved pre-operative checklist completions but also helped bring the various departments together to establish lasting links of respect and understanding in regard to workflow, expectations and workload between them. The non-tangible benefits of this project were invaluable: relationships between the departments have been enhanced and there is a marked increase in collaboration among them (e.g., an OR nurse would no longer hesitate to assist another department in preparing a patient when the department is in over-capacity mode). Our results also showed that staff were keen to take part in QI studies. For example, the nurses liked the education sessions and appreciated being consulted. 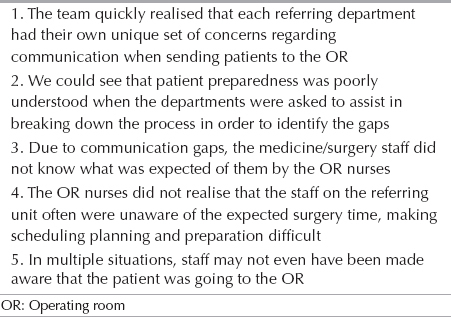 To our knowledge, this study is the first to solely look at ways of improving pre-operative patient preparedness checklists in such detail in a rural area. Therefore, we could not compare the results to other publications. Nevertheless, our results build upon those displayed in the literature. Panni et al. in 2013 investigated the effects of a pre-operative checklist and team training programmes and found that these additions (along with a pre-operative facilitator) substantially improved their OR efficiency. Overdyk et al. also performed QI measures for their own circumstances to improve their OR efficiency, including educational periods (e.g., meetings, memos and poster boards), and found that the OR efficiency improved. Being one of the first of its kind, this study proves that a quality control study and quality improvement programmes can indeed be done in a small rural hospital. Barriers to performing a QI evaluation in a rural hospital might include getting staff to participate in an education plan, to provide qualitative feedback and general financial constraints. In addition, a perception on the part of staff regarding a lack of time to fill out checklists might be encountered. Therefore, educating staff that this may be the most time-effective way of passing vital patient information onward increases the chances of the QI initiative's success. This study has several limitations, the most obvious of which being those of size and scope, as the study was only performed in one isolated hospital, which affects the potential generalisability of the implementations. However, the simplicity of the design demonstrates that it should be easily implemented or at least provides some guidance, to any other medium- or small-sized hospital. This study found that a comprehensive and multi-pronged approach to improve patient pre-operative preparedness resulted in marked improvement in satisfactorily meeting quality improvement criteria over a 1-year period. Barriers to proper preparedness and improvement thereof were evaluated and solutions suggested. This study aims to help guide other hospitals seeking to tackle the issue of incomplete pre-operative checklists. Acknowledgements: The authors would like to acknowledge the technical help of Mr. Simon Duncan, Mrs. Marie Steele and the cooperation of WDMH staff involved in this QI study. Gillespie BM, Marshall A. Implementation of safety checklists in surgery: A realist synthesis of evidence. Implement Sci 2015;10:137. Erestam S, Haglind E, Bock D, Andersson AE, Angenete E. Changes in safety climate and teamwork in the operating room after implementation of a revised WHO checklist: A prospective interventional study. Patient Saf Surg 2017;11:4. Kenton K, Pham T, Mueller E, Brubaker L. Patient preparedness: An important predictor of surgical outcome. Am J Obstet Gynecol 2007;197:654.e1-6. Panni MK, Shah SJ, Chavarro C, Rawl M, Wojnarwsky PK, Panni JK, et al. Improving operating room first start efficiency – Value of both checklist and a pre-operative facilitator. Acta Anaesthesiol Scand 2013;57:1118-23. Overdyk FJ, Harvey SC, Fishman RL, Shippey F. Successful strategies for improving operating room efficiency at academic institutions. Anesth Analg 1998;86:896-906.